Ocado (OCDO) shareholders didn’t know whether they were coming or going on the morning of the annual results. The shares dropped nearly 4% at the opening as investors took fright at figures showing higher turnover but higher losses, not quite the combination that investors like. Soon, however, the shares had recovered the losses, dragged up by a strong showing in the wider stock market. By midday Ocado was nearly 4% ahead, making it one of the best performers of the day. It just goes to show how opportunities open up for alert investors. I’ve never been keen on Ocado, as regular readers of this column will know. It still hasn’t found a niche despite attempts at various deals and it continually struggles to get into profit. So it could well do without the unfortunate fire at its Andover distribution centre, which coincidentally broke out on the same day as the figures were issued. Investors initially ignored this setback despite its inevitable disruption to 10% of Ocado’s capacity. However, when the blaze flared up again overnight causing substantial damage there was no hiding place and Ocado shares fell 4.7%. Ocado sensibly has comprehensive insurance for the property, stock and equipment on site, and for business interruption losses. However, no insurance can fully compensate for disruption to any company’s ability to conduct, let alone grow, its business. Ocado admits “there will be a constraint on our ability to meet our growing customer demand and there will be a reduction in sales growth until we can increase capacity elsewhere”. 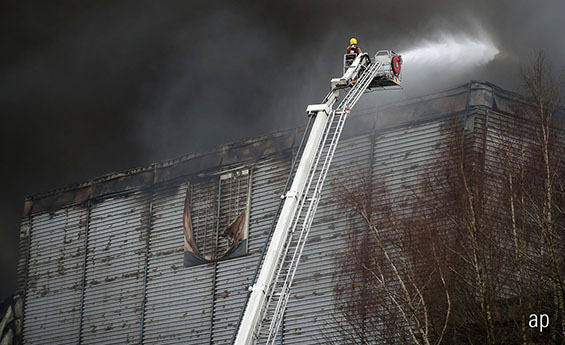 You can’t blame Ocado management for the fire and its consequences but the board already had quite enough to think about, not least a possible deal with Marks & Spencer (MKS) which strangely merited no mention in the results announcement. Instead there was a pile of stuff as usual about the growth story that is only just beginning, a growth story that may not include Waitrose after next year but which will undoubtedly come at enormous expense. I didn’t rate the shares a buy before the fire; I rate them even less after a disruption that Ocado can ill afford. It looked good at Thomas Cook (TCG) when shares jumped 12% until you realised that was still a rise of less than 4p, so far have the shares slumped since last May’s peak of 146p. In fact, the first quarter trading figures didn’t justify any increase at all. Revenue edged slightly higher but the operating loss in what is admittedly the worst quarter for any travel company rose £14 million to £60 million. Early bookings for the key summer period are down on this time last year. Apparently we enjoyed the sunshine so much last summer we haven’t felt inclined to go skiing in Scandinavia or pay higher prices for winter sun in the Canaries. Cook is thinking of selling its airline and spending the cash on hotels. Good luck with that. The difficulties at Monarch, Air Berlin, Air Norway and Flybe suggest there may not be much appetite for taking on another outfit. Any rise in the shares is a chance for the unfortunate shareholders to get out. It is possible that Cook will come good again but I can’t see much sign of that in what remains a highly competitive market. The day after the results, the shares gave up most of the gain. If I have to choose I still prefer TUI (TUI) despite a fall of 18% in its shares after the travel operator admitted earnings for its current financial year will be broadly stable on last year rather than the double digit growth the board had hoped for. Management there seems to have a much tighter control over the business in difficult circumstances. Are Retail Stocks a Buy in the January Sales?